Join us for our Churchwide Retreat this year. Retreat Pricing: all prices include 2 Nights Stay, 5 meals, 2 snacks and access to the available Koinonia activities that are open. Q1) Can I come to the retreat for just part of it or for one day? A1) We do not offer daily options for the retreat. We want to encourage people to come for the entire weekend of the retreat. Q2) How many beds are there and how much space are in the cabins? A2) Cabin sizes will range from 6 to 10 beds. All beds are twin size beds unless "full" size requested during registration. All cabins have a good amount of floor space to fit a couple pack & plays and all of your luggage. Q3) I do not own a sleeping bag. Can I bring blankets and bedsheets? Q4) Can I bring video games, iPads or other electronics? A4) We encourage everyone to stay unplugged for the weekend. Unless absolutely necessary, please try to not bring/use electronics for this weekend. There is no phone reception at Koinonia. Q5) What activities are available at Koinonia? Q6) How far are the accomodations from the dining hall and main worship hall? 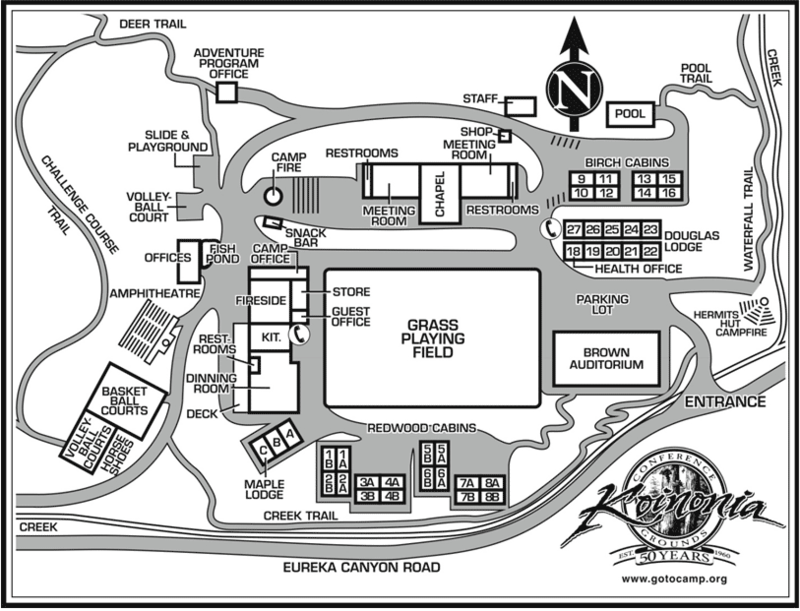 A6) All of the cabins (Redwood, Douglas, Birch cabins) are relatively close to the dining hall and main worship hall. The main part of the camp is all within view of each other. Click here for a map. Q7) Are there locks on the cabin doors? A7) The cabin doors do not have lockable locks. We encourage everyone to keep any valuables in their vehicles during the retreat.